When you are driving and it starts to rain, you may start to panic. Suddenly, the clear road in front of you becomes blurry. 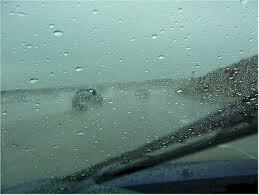 Even with good windshield wipers, the roads become shiny and it becomes a lot harder to see where you are going. The millions of water droplets in front of you are reflecting the lights in every direction possible, making it almost impossible to accurately evaluate the traffic in front of you. There has to be something I can do? Unless you are Bruce Almighty, there is no way you can make the rain stop on demand. If you find yourself stuck in a massive downpour, the best thing that you can do is pull over and wait it out. However, if the rain is only coming down at a light to moderate pace, you should be able to keep driving with good visibility if you use this handy little trick: According to Snopes, the easiest way to improve your visibility on the road during a rainfall, apart from becoming a superhuman, is to put on your sunglasses. But isn’t it already dark when it is raining? Why would I make it darker? Yes, even during the day, the rain tends to bring a certain level of gloominess with it. However, if you have polarized sunglasses, they will help you see well because they deflect all of the random light waves that occur during a rainfall. Instead, you will be able to see through the rain (as much as possible) so that you can continue driving safely. What if I don’t have polarized sunglasses? Will any sunglasses work? Actually, no. Un-polarized sunglasses do nothing to block out light rays. All they do is add a tint that makes things darker. If all you have are regular sunglasses, please do not put them on during a rainstorm. They will only make matters worse. Well, if you live somewhere that gets a lot of rainfall (cue Seattle), then you should probably go out and invest in a pair of polarized sunglasses. They will improve your visibility much better in a variety of weather conditions. Otherwise, just drive as defensively as you can. Keep both hands on the wheel and both eyes on the road at all times. While you should be doing this all of the time, it is especially important during less than perfect driving conditions. IMPORTANT SIDE NOTE: Polarized sunglasses will only benefit you if it is raining during the day. During the night, please keep ALL sunglasses off and just try to focus on the road as much as possible.